Uninstalled CAM and it deleted all other software and games in the same folder. Your software is bad. Everything installed in the same folder is gone, how does that even happen? Whoever coded this does not know what they are doing. I uninstalled to try and get it to see my Kraken x60 and it does this. God. job. Hello, please allow me to clear something up. Are you saying that you uninstalled CAM and it deleted other programs that were installed in the Program Files (x86) folder? Or did you have some games installed within the CAM folder and it deleted those games? i vecchi bug che avevo segnalato nel menù sono stati risolti, ora però ce nè uno peggiore, non mi fa più fare il login!! non so se è un problema solo in italia ma continua a uscirmi la scritta: "an error occurred while trying to comunicate with the server"
Hello, when this happens, please close the program and re-open it. It should work again. If it doesnt, let me know so we can get in touch with you and review the logs. My system is currently using one X61 and one X62. The X61 had no problems being detected in CAM, however after I installed the X62, only the X62 shows up on CAM and the X61 is nowhere to be found. Followed all of the driver troubleshooting posts on here but did not work. Is it even possible to have an X61 and X62 running on CAM at the same time? Thank you for reporting this. I will inform our devs of your issue so they can test this setup and verify if it gives the same errors you are reporting. Cam used to see my Kraken X60 but now for some reason it has decided that it will not see it anymore? Cam used to see my Kraken X60 but now for some reason it has decided that it will not see it anymore? Why can't I just download the old Kraken software, it was slow to respond when changing fan speed but at least it worked. Hi, here are the troubleshooting steps to try and get CAM to view your Kraken device please follow them and let me know if this works. Go into Control Panel and click on “View Devices and Printers” then remove the 690LC/Asetek Driver/Unknown USB Device and restart your PC. Then check CAM again. If you still see a Unknown USB Device, then it seems that the USB cable is creating a bad connection to the motherboard. This likely means the unit would have to be replaced. Please contact our support team over at https://www.nzxt.com/customer-support to look for an RMA on the unit. If you do not see any these devices then that means that the Kraken is not making a connection to your motherboard as Windows does not detect the driver. You may want to contact Microsoft and see if they have any input as to why your USB device is not recognized in Windows. Try shutting off your PC, then plug the USB cable to a different USB header on your motherboard. This is to check if the USB port on the motherboard is working correctly. I thought my wiped setting was going to be solved. I got the system to stop wiping my settings, or so I had thought. Had my headphones on and playing an intensive game and then take my headphones off and hear my fans being whisper quiet. MY SETTINGS HAD BEEN WIPED AND MY SYSTEM WAS HOT AS HELL AGAIN BECAUSE IT SET EVERYTHING TO SILENT. Also why can I no longer see the temp speed of my Kraken? I can set the fans by liquid but cant see the liquid temp? why? At this rate, I am just going to rip all of NZXT products out of my system and just do everything custom. What is the point of having the "convenience" of this when its not convenient at all? I am tired of having to completely uninstall this thing and re-install it to get it to work. This is ridiculous. Hello, if this happens again, please let us know which version of CAM you are using and what your PC specs are so we can verify what caused the settings wipe. Thank you and sorry for the inconvenience. Hi, what version of CAM are you using? Please update to the latest version (currently 3.7.0), preferably uninstalling the previous version and downloading from http://camwebapp.com/download/ and let us know if it is still happening. Hi, please let us know which GPU make/model you have. Thanks. No FPS on any games. No Cam startup when system starts. No Kraken info on dashboard or mini Cam. Other than that everything is as in bad as normal. Please update to 3.7.0, The startup when system starts was fixed in that version. If you still can’t see your Kraken info, then let me know. CAM 3.6.8 wont let me change nor save custom settings. Hi, sorry for the late response. Please update to the latest version (currently 3.7.0) which you can download from here: http://camwebapp.com/download/ and let me know if you are still having this issue. Every time the CAM software launches -despite being logged in- my fans are all set to silent, and my fps display is .... broken - it works, but it will say top left, or top right, then I launch the game and it will move, and if I alt-tab in the game then it moves again .... ? It's at the point that I alt tab in and out of my game so the FPS display is where I need it, since disabling the display in the CAM software does nothing. And setting up custom fan profiles just to have them deleted every time the software exits is far from the perfect user experience. 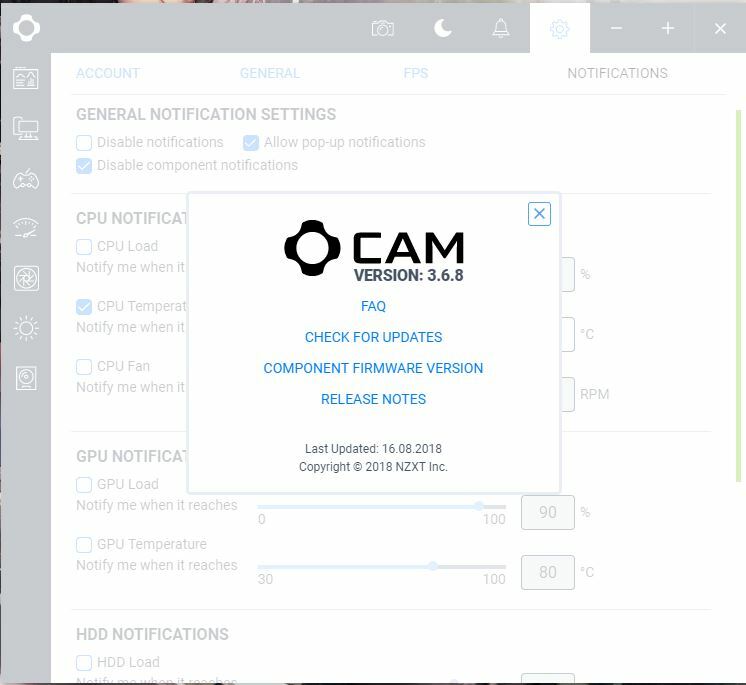 Hello Zbee, please update to the latest version of CAM (currently 3.7.0, which you can download here: http://camwebapp.com/download/) I’d suggest uninstalling the previous version first and then installing this one. After this update, verify that your settings were downloaded correctly. (I have 2 users for testing this and the FPS settings are correctly downloaded when I update). If the settings are wiped again, please let us know so we can get in touch with you to verify your logs. Hello, What NZXT hardware do you have? Is the hardware being controlled correctly? If you have an NZXT Fan, it is controlled from the Cooling Tab, not the Overclocking tab. And please let us know if this update fixes your ring colors issue or not. I have encountered two problems with the NZXT software. I want to clarify that I recently reformatted my PC by reinstalling everything from scratch. The OS is Windows 10 Pro v. 1803 and the mainboard is an MSI Z97 Gaming 7. In addition, now every time I restart the PC, the program loses the setting related to the minimized start and remains open to me and I have to manually minimize it every time. I have also opened a ticket in this regard (ticket 166841) and are available to provide further logs and / or information. And let us know if this update fixes the fan issue as well. After booting up the pc and launching cam, cam will load normally but get stuck in 90%. i am using the latest version of cam and it is not my internet I'm using ethernet. Hello, please update to the latest version of CAM (currently 3.7.0, found here: http://camwebapp.com/download/) and let us know if this fixes your issue. 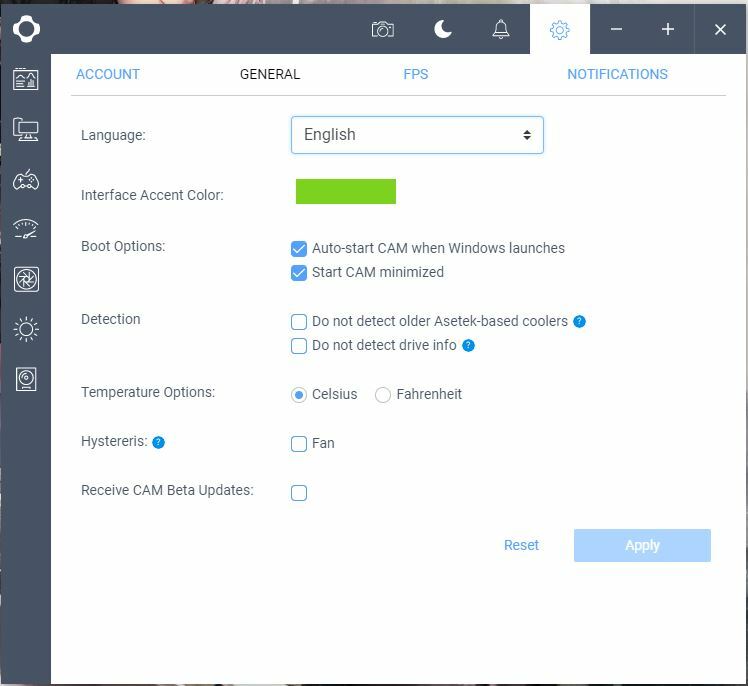 Hello, please update to the latest version of CAM (found here: http://camwebapp.com/download/) and try these troubleshooting options. Let me know if they help. If not, also let me know so we can verify your logs. If you are using a Kraken X42/X52/X62/X72 and CAM is not detecting the device. You can try these troubleshooting steps. Go into Control Panel and click on “View Devices and Printers” then remove the NZXT USB Device/Unknown USB Device and restart your PC. Then check CAM again. If you still see a Unknown USB Device, then it seems that the USB cable is creating a bad connection to the motherboard. You can try using a different USB cable to check and see if the USB cable that came with the package is faulty. You can use a mini to regular USB cable and route it to the back of your case to test this issue. If the cable is the issue, please contact our support team over at https://www.nzxt.com/customer-support to look for a replacement USB cable. Precision X, Gigabyte Xtreme Gaming, RGB Fusion, Asus Aura, MSI Mystic, Afterburner, Corsair Link. We will be working in future versions to improve compatibility between the different software programs. Try connecting the Kraken to a different PC/Laptop and see if it is detected in CAM. You only need to connect a external mini USB cable and see if CAM detects the unit. If it is still not detected then it is a faulty unit and we can RMA it. Please contact our support team over at https://www.nzxt.com/customer-support to look for a replacement unit. I don't know why but Your program started to shut down my kraken x62 pump. 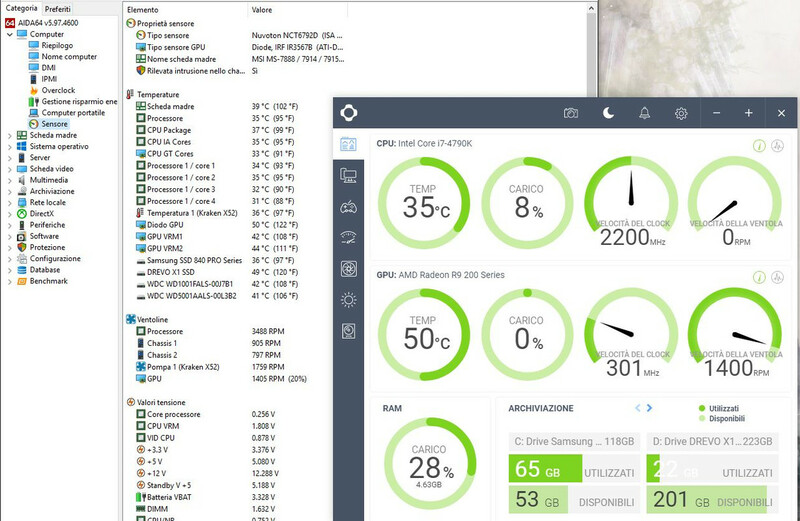 I have threadripper 1950x and yesterday its temperature was growing up non stop. I realized that when Your cam software was starting, my pump instantly turned off. Uninstalled cam, everything is fine. I have Installed latest cam, problem appeared againg. Hello, I was asked by the devs to ask you to upgrade to 3.7.0 which is the latest update, by downloading from here: http://camwebapp.com/download/, and see if this fixes the issue. - Does it actually turn off or just run slow? - What setting do you currently have active? - Could you provide a screenshot of the software’s cooling tab? Hello, I'm having a problem - the program does not see installed in the system block water cooling system Kraken X62 ...... body NZXT H700i .Help please solve the problem. For 2 updates, the application does not save the configurations of the fans and the pump. Every time I restart the computer or close the application, the settings are restarted. I have use 2 screens in my computer setup. Earlier versions of the CAM software would allow me to place the CAM window in my second screen and upon restarting still keep the CAM window on the second screen. Over the last few builds of the software it now opens on my main screen rather than my secondary. Please advise. Hello, thanks for the input. We are aware of this issue but it is not in our list of priorities to take care of yet. We hope to fix it in a future update, but there is no ETA right now. Sorry.